A beautifully English family saga, with dramatic secrets from the past. Set in the idyllic coastal town of Southwold. Posy Montague is approaching her seventieth birthday. Still living in her beautiful family home, Admiral House, set in the glorious Suffolk countryside where she spent her own idyllic childhood catching butterflies with her beloved father, and raised her own children, Posy knows she must make an agonising decision. Despite the memories the house holds, and the exquisite garden she has spent twenty-five years creating, the house is crumbling around her, and Posy knows the time has come to sell it. Then a face appears from the past – Freddie, her first love, who abandoned her and left her heartbroken fifty years ago. Already struggling to cope with her son Sam’s inept business dealings, and the sudden reappearance of her younger son Nick after ten years in Australia, Posy is reluctant to trust in Freddie’s renewed affection. And unbeknown to Posy, Freddie – and Admiral House – have a devastating secret to reveal . 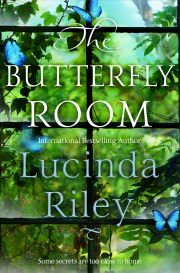 . .
Full of her trademark mix of unforgettable characters and heart-breaking secrets, The Butterfly Room is the new spellbinding, multi-generational story from Sunday Times bestseller Lucinda Riley.